CES 08 Unveiled gave Viable the opportunity to show their VPAD, a wireless portable videophone designed specifically for the deaf and hard of hearing. Not only does the VPAD have light displays to indicate incoming messages/calls, it also allows the hearing impaired to take the kit with them so they can sign in to their Video Relay Service which enables them to effectively have a portable translation service. So, imagine the scenario; you’re deaf and need to visit your insurance agent to discuss your policy. 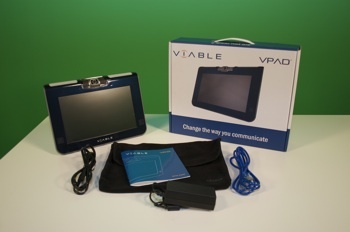 If you take your VPAD with you to your insurer’s office, you don’t have to rely on them being able to translate for you. You sign in to your VRS and you’ve got your own translator with you. A simple, but effective and innovate idea design by and for deaf and the hearing impaired. As an added bonus (if you even need one), when the VPAD is in idle mode, it also doubles up as a digital picture frame. Have a look at Viable for other great next generation VRS for the deaf. You are incorrect. If you are using your VP while in the same room as a hearing person, you cannot use VRS services. There is another service for that called VRI. Video remote interpreting. The insurance agency will pay per minute for the interpreter. The goverment will not pay for an video relay interpreter to interpret while the deaf and hearing people are in the same room. This is the responsibility of the insurance agency. hello derek me can vpad?